Beechwood Veterinary Practice are proud to announce we have achieved accreditation as a Cat Friendly Clinic (CFC). The CFC programme has been developed by the International Society of Feline Medicine, the veterinary division of the leading feline charity International Cat Care, and accreditation has been made available in partnership with Ceva, Royal Canin, Boehringer Ingelheim, Idexx, Elanco and Zoetis. It aims to promote well-being and high standard of care for all cats visiting or being hospitalised in a veterinary clinic. Under the programme, a clinic has to prove rigorous adherence to a set of criteria which includes provision of facilities and demonstration of staff activities and attitudes aimed at reducing stress in cats, both as in-patients and out-patients. The criteria includes having separate dog and cat waiting areas, feline-friendly hospitalisation cages, and veterinary equipment specifically for treating cats. Most importantly, staff are trained in approaching and handling cats sensitively and respectfully. Here at Beechwood we wanted to make sure that a trip to see us was as stress-free as possible for our cat patients and their owners. Cats can get very anxious when taken out of their usual environment, and this can make owners reluctant to seek veterinary attention when their cat needs it. Take a look at our cat parking station at the right of this article! 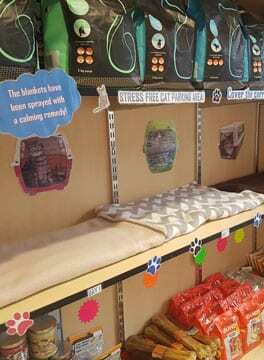 This area helps reduce stress for our feline friends whilst they wait to be seen. It’s elevated off the ground and the blankets have been sprayed with a calming agent, which can be used to cover the front of the carrier. We also have a cattery for our feline inpatients, giving them the space they need completely separate to our dog ward. By undertaking cat friendly accreditation, we’ve committed to delivering high standards of cat care, with compassion and expertise. Cat owners can find out more about International Cat Care and the Cat Friendly Clinic initiative on their website and also on our Cat Friendly Clinic website page.